Since we're in the middle of a couple snow days, I decided to revisit my baby mermaid pattern. This time, I made the mermaid tail two colors. I also worked up a pattern for a seashell top. Last row, scallop: sk first st, *5 DC in next stitch, skip next st, sc in next* repeat twice across, chain 1, fasten off leaving several inches to sew with. Row 3: sc in each st across, ch 1, fasten off leaving several inches to sew with. With F hook, make a chain of 50 for each side tie. Leave long tails for sewing. 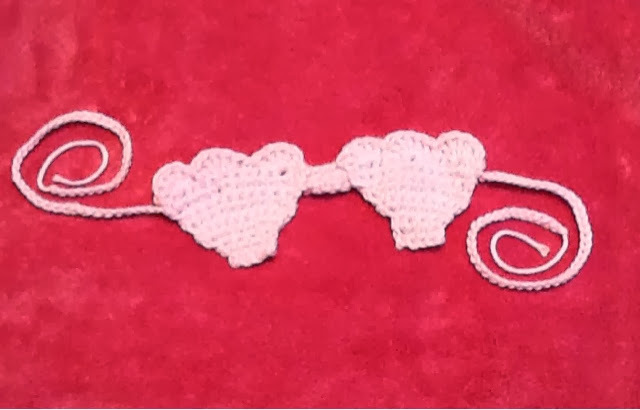 Sew shells together with connector piece; sew side ties on either side. Weave in ends. I didn't see any size on this? Just for a baby. 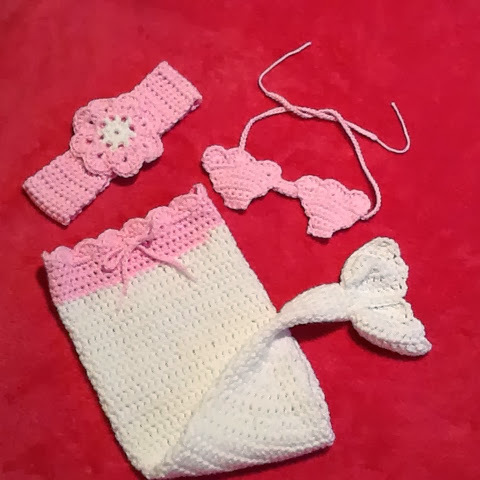 I would like to make one for a baby that will be almost a year? Will this be okay. It is beautiful! OOPS! The rest of the pattern is not there, just the bra??? I would pay for this. Let me know.